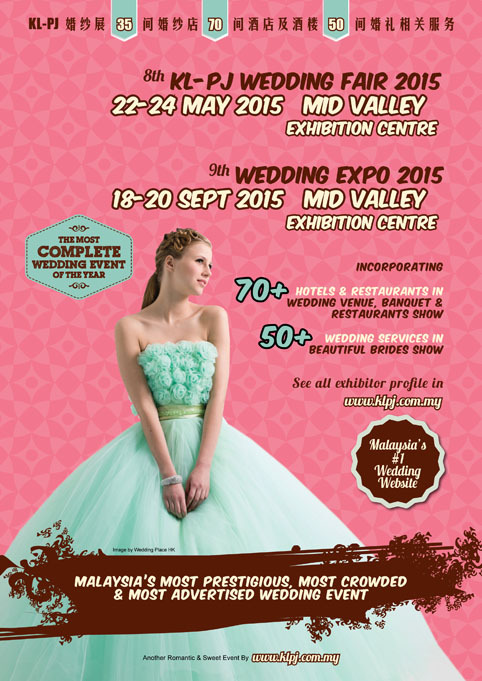 KL-PJ Wedding Fair 2015 from 22-24 May 2015 at Mid Valley Exhibition Centre, Kuala Lumpur is the most crowded, most advertised wedding exhibition in Malaysia. Meet over 70 Hotels & Restaurants in within Klang Valley. Over 70 Hotels & Restaurants to choose from KL & PJ area! Plan your dream wedding venue / wedding dinner within your budget or in the most luxurious 5-star setting banquets. All under one roof, exhibitors include Malaysia’s best spas, beauty and slimming salon, wedding gowns and dresses, shoes, jewellery, wedding planner, live band, cake makers, stationers and more! KL-PJ Wedding Fair 2014 has everything you need to plan for a truly unique wedding day and to make you the super-beautiful bride of the day!